35. To have "Eternal life"
Antoine de Saint Exupéry tried to help us understand the necessity of dying so as to be reborn elsewhere in his book "The Little Prince". ... My Little Prince was as pale as snow. I felt his heart beat, as would that of a dying bird. My star will be just above the place where I fell last year. And an old abandoned shell will be left behind! Do not be sad, you will always be my friend. You will lift your eyes to the heavens and look at the stars. And I'll live in one of them. And I'll laugh because I will have played a trick on you! John 3 v 2. One night, a leader of the Pharisees called Nicodemus came to find Jesus. Jesus did not seem surprised by this strange night visit. A temple leader, a high Sanhedrin (From Palestine's supreme court) dignitary, one of the highest members of the Pharisees came to see him in secret by night, to ask him questions in secret and make a strange declaration of faith and profess his admiration. Nicodemus was not one of the bad Pharisees overwhelmed by hatred and conceit. No, he was one of the rare doctors of the law who was really searching for truth and God's will. Even if Nicodemus was afraid of being seen by his colleagues, he was unable to resist the temptation of asking fundamental questions to the man who fascinates him, and from whom he would like to learn so much. Master, how can a man see (enter into) the kingdom of God? How can a man (like me) be born (again) when he is old? Can he go into his mother's breast and can be born again? "YOU are a DOCTOR in Israel and you don't know these things! In truth I tell it to you, if a man is not born of water and mind, he can not enter in God's kingdom. What was born of the flesh is flesh and that born of the spirit is spirit. "Wind blows where it wants. You hear its noise and yet you don't know where it comes from, nor where it goes. It is the same for all man been born of the spirit. It is more than likely that in spite of all his good will, Nicodemus didn't understand all the importance that night this revelation which emphasised the difference between the material body and the spirit (the soul), which journeys into the sky and reaches eternity. The absolute confidence in those who protect him and the family, ensuring his security and food daily. To keep the soul of a child is not easy! I didn't take a path of sizes that passes me Like a child against its mother, I hold my soul in peace and in Silence. My soul is as me like a weaned child. A little time later, Nicodemus will overtly take Jesus' defense with his colleagues of the Sanhedrin. Will they mock him, asking him if he is also from Galilee? After the departure of the Master., Nicodemus integrated to the newborn church and we can be sure that the day when the old man closed his eyes, the wind that blows over Judea carried away the soul of the old doctor to rejoin Jesus: to the country where one is born again and lives in the spirit: in PARADISE. 33. THE THREE KINDS OF "BAPTISM"
Water is a symbol of natural purity. One can only drink the pure water and aquatic life can not live in water which is polluted. Water is therefore essentially a food indispensable to the body and the growth of life. Water purifies - The Jews had at the entrance of their houses a big urn that they used to wash their hands in before every meal. Don't we also wash our dirty linen with water? In the time of the Christ, John the Baptist baptized his followers in the Jordan, granting them the baptism of purification; washing them of their sins (ie absolving them of their past mistakes) and inciting them to start a new life. Jesus also gave to his disciples the power to baptize pilgrims to the manner of the Baptist. Today one baptizes small children symbolically to give them the title of a child of God, that is to say adopted by the Father. This sign replaces the ancient circumcision: God's mark on the flesh, and can be thus also used for small girls in the same way. The Spirit is light, life, love, truth, and the nourishment of the soul. That is to say all that children need to understand the word of God and to put it into practice. (John 6, v.6): "It is the spirit that gives life, the flesh is useless. The words I spoke to you are spirit and life'. (John 14, v.6): "I go to the Father, but I will not leave you orphaned. I will ask the Father and he will give you another advocate, the Holy Spirit." (John 16, v.13): "When he comes, however, being the Spirit of truth, he will not speak on his own but will speak only what he hears and will announce to you the things to come. These two basic baptisms constitute a double promise: God recognizes us as his children and we recognize him as our Father." Matthew 25, v.14 'A man who was going on a journey called in three of his servants and handed over ;his funds to them. He gave five talents to the first, two to the second and only one to the last. When he returned, a long time later, he asked them to account to him for the money. The first, who had received five talents had made another five, the second, who had received two talents had made two more The Master congratulated them, and put them in charge of more important affairs. How many people at present bury their talents and let them slumber amid the turmoil of daily life? Even if their talent is very small the Master will one day ask them to account for it, and if, out of sloth, they have produced nothing He will reject them. In this third form of baptism life is no longer a mindless contemplation of the void but, freed of the body, passes from one life form to another. In baptism by water the human being becomes the child of God. (Luke 12, v.50): "I have yet another baptism to receive. What anguish I will feel till it is over!" How ignorant is man! It is obvious that if an angel appeared at our door bathed in a holy aura we would immediately receive him with respect. But angels can appear in all sorts of unexpected forms! Thanks to the Sadducees, who represent the old aristocratic Jewish families in the Sanhedrin and which formed the second largest political group after the Pharisees who did not believe in the resurrection of the dead, we are to receive from the Master's mouth the facts concerning life after death. Ref. to biblical texts: Matthew 22(23-32) and Luke 20 (27-38). "Teacher, Moses declares, if a man dies without children his brother must take the wife and produce offspring for his brother. There were seven brothers all of whom married the same woman without leaving an heir. After burying the seven brothers the woman also died. At the resurrection whose wife will she be? "The children of this age marry and are given in marriage (which is in this case the age of which Jesus is speaking) 'but those judged worthy if a place in the age to come (through life eternal) and of resurrection from the dead do not. They become like angels and are no longer liable to death' and ' they are sons of God'. Food, work, leisure, ambition, our desire to live happily, and prepare a quiet retirement free of worry, to a little house in the country, etc so we grow old slowly without realizing it. First come a few wrinkles that we cover up with creams, then come the first white hairs, the first teeth are lost, slowly but inexorably the body becomes increasingly fragile, more sensitive and more painful. Old age is not merely a hopeless period in the life of the body. It is an important STAGE in life, the best moment to come into communion with God and with oneself and to prepare for the future life in the spirit when there will by no more sickness, hunger, suffering nor loneliness. The community of the spirits into which will be admitted only those 'deemed worthy'. To be like the angels! What a dream and a consolation to the sick, the accident victim, the paralytic, the blind who moves in eternal darkness, the black who is abused because of the color of his skin, the wretch who is imprisoned because of his political opinions or those who slowly die of hunger and cold in the street. What wonderful hope will be come true at the time of the third baptism, when the soul will find its new being and, according to the apostle Paul receive a 'new body' (Texts based on the chapter concerning resurrection of Jesus-Christ). Then we will live free of the laws of gravity, distance and time. True, man is by nature distrustful and there is a Thomas deep in all of us. It is difficult to believe when one can neither see nor touch. And yet the progress of science instead of invalidating our long held beliefs only reinforces them. With the help of ever more perfected machines doctors have managed to bring the clinically dead back to life for several hours! The following strangely similar testimonies have been collected in India, Europe and America from people who have never met. A. Out of body experience: Patients describe their second body as a light and floating which can see and move among humans without being able to communicate with them. often with people he has known and who have been dead for some time. They come as friends to help and reassure the human as to his destiny. The being emanates a warm and reassuring glow . They talk to the patient in an unknown language which he nevertheless understands. They sometimes review a life, comment on certain situations and give advice! Even if this approach to life after death remains (in the absence of material proof - in which case what would be the role of FAITH) very taboo and varies according to various religions. Certain Hindus for example, think that a soul who has erred on Earth may be reincarnated in the body of an animal! All religions agree on one common point: We must do the maximum amount of good here below (while there is still time) in order to earn our way to a new life in heaven. "Teacher, what must I do to inherit everlasting life?" "What is written in the Law? How do you read it? "You shall love the Lord your God with all your heart, with all your soul, with all your strength and with all your mind, and your neighbor as yourself" (Levit 19 v.28). Jesus said: "You have answered correctly. DO THIS AND YOU SHALL LIVE. These two sentences epitomize the two commandments which sum up the whole Bible and which form the BASIS of the three great religions founded on the thought of the Egyptian sage IMHOTEP; who 4,750 years ago, introduced the notion of eternity and of love for your fellow being . Here the Master takes time to explain his doctrine through the parable of the good Samaritan. A priest and a Levite happened to be going down the same road and went by without helping the dying man. This example is very telling as the men Jesus mentioned were in the service of God, employees of the temple, two priests who, the story goes turned away their eyes so as not to see the DYING MAN whom they did not hesitate to abandon without help on the side of the road. Jesus, the great walker, knew this long and solitary road which winds from the banks of the Jordan up to Jerusalem built on the crest of the mountain of Zion. Along this road came a Samaritan who was moved to pity at the sight of this badly wounded man. He bound up his wounds, put him on his own beast and brought him to an inn where he cared for him, paying in all costs in advance and then going on his way leaving no name or address. The lesson is all the more telling because this man was a 'false' Jew, a cross-breed resulting from the deportation of the twelve tribes of Israel into Assyria, proscribed by the Jewish community of Jerusalem because the Samaritans would not pray to God in the temple at Jerusalem but prayed to the same GOD ;in the temple of Samaria. And yet it is this man, reject from Jewish society; this Samaritan hated and despised by the Jews, who is moved to compassion and saves the life of a man who may, for all he knew, have belonged to that very religion, opposed and yet so close to his own. But the lesson does not end here. It is truer today than ever as it concerns all of those who, with only their conscience as witness, have failed to stop to help their fellow beings who were dying by the roadside! "Which of these three, in your opinion, was the neighbor to the man who fell in with the robbers?" "The one who treated him with compassion", answered the lawyer. "Then go and do the same". 'On these TWO commandments the whole of the law is based, and the prophets as well'. And leading he ewes with care. The sick I will heal. And I call each sheep by its name. And they shun the voice of strangers. If only one lamb goes astray I cannot rest. I go from bramble to thorn bushes and along the edge of precipice until I have found her. My joy is great when I free her and I put her on my shoulders and bring her back to the flock. When the wolf attacks my sheep I do not abandon my flock but give up my life to saving them. John 10, v16 I have other sheep that do not belong to this fold, I must lead them too and they shall hear my voice. There shall be one flock then, one shepherd. 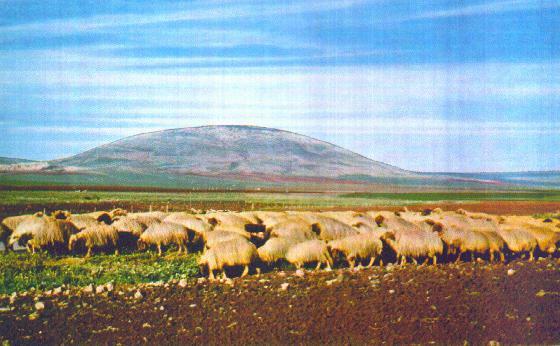 Flock of sheep on Mount Tabor. John 14, v.11 Shortly before his death Jesus told his disciples: "I am in the Father and the Father is in me". John 12, v 49. "For I have not spoken on my own, no, the Father who sent me has commanded me what to say and how to speak and I know that his command is life eternal". John 14, v.23: "Anyone who loves me will be true to my word, and my Father will love HIM we will come to him and make our dwelling place with HIM". John 8, v38: "I tell you what I have SEEN in the Father's presence; you do what you have heard from your father". John 10, v.30. "The Father and I are one". John 14, v.21. "He who obeys the commandments he has from me is the man who loves me; and he who loves me will be loved by my Father and I too will love him and reveal myself to him". John 14, v.28: "If you truly loved me you would rejoice to have me go to the Father for the Father is greater than I"
John 16, v.27: "The Father already loves you because you have loved me." Subject us not to trial but deliver us from the evil one. This is how the Master taught us to speak to our Father. (Luke 11, v.11-13): "What father among you will give his son a snake if he asks for a fish, or hand him a scorpion if he asks for an egg. If you, with all your sins, know how to give your children good things. How much more will the heavenly Father give the Holy Spirit to those who ask him." (Matthew 6, v.6): "Whenever you pray, go to your room, close your door and pray to your Father in private. Then your Father, who sees what no man sees, will repay you." When you are praying do not behave like the hypocrites who love to stand and pray in synagogues or on street corners. They are already repaid." "In your prayers do not rattle on like pagans. They think they will win a hearing by the sheer multiplication of words! Your Father knows what you need before you ask him". "Enough then, of worrying about tomorrow. Let tomorrow take care of itself. Today has troubles enough of its own.". "If God can clothe in such splendor the grass of the field will he not provide much more for you, O weak in faith? Yet I assure you, not even Solomon in all his splendor was arrayed like one of these. Look at the birds in the sky. They do not sow or reap! They gather nothing into barns; yet your heavenly Father feeds them. Anyone who hears my words and puts them into practice is like the wise man who built his house on rock. When the rainy season set in, the torrents came and the winds blew it did not collapse; it had been solidly set on rock. Fear not (have faith) for even the hairs of your head are counted". God creates his works in silence and perfection, be it a snow flake, a flower that blooms, or a drop of rain which falls from the sky and feeds the torrents and the rivers which nourish all of nature. God is omnipresent from the peaks of the mountains, in the millennial glaciers and in the ocean depths . His invisible hand is present and moulds the natural world which he has given to man! And yet our Father wished us each to have our own personal identity. He made each of us into a UNIQUE and responsible being. UNIQUE: as our fingerprints, the lines in the palms of our hands, the composition of our hair, the links of our ADN, and many even smaller elements which ever advancing technology permits us now to discover. (Luke 18, v.10): "Two men went up to the temple to pray; one was a Pharisee, the other publican (tax collector). "this man went home from the temple more justified than the other". 'O God! I give you thanks for the salaries and comfort that you have given me. I give to the charities reserved for the whites and I give them checks on which my name is clearly printed so that they do not forget that I am their greatest benefactor. I thank you that I am not like that black back there, a parasite of society. (Luke 18, v.14): "For everyone who exalts himself shall be humbled while he who humbles himself shall be exalted".